The Washington Township 21st Century Skills Initiative began ten years ago with a single community volunteer in a classroom. It has grown into a communitywide initiative that reached 3,402 students in every elementary and middle school in the district in 2016-2017, providing instruction in financial literacy, career readiness and entrepreneurship at no cost to the school district. In 2006, parent Anthony Panto volunteered in a classroom, using his skills as a financial advisor to teach children about wise money management. He was impressed by the Junior Achievement (JA) lessons available, and wanted all students to receive the information. A schoolwide partnership involving students, teachers and parents was proposed, and the school’s PTO got involved, organizing a group of parent volunteers who received training to teach the sessions to an entire school. Teachers embraced the JA programs because they aligned with state learning standards, and are delivered via hands-on, experiential learning modules. After a successful program in one school, teachers and parents wanted to expand the program to the other elementary schools. Along with engaging parents, they had an innovative solution: Washington Township High School students were trained and prepared to team up with parents, and also volunteer in elementary classrooms. 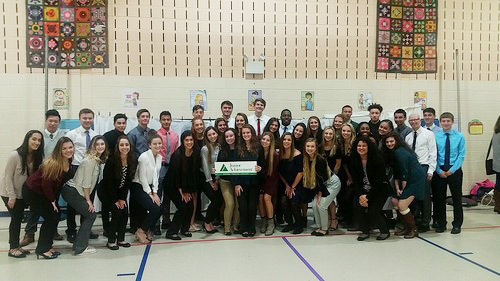 In addition to participating in meaningful service learning, the high school students were building presentation, time management and leadership skills, while teaching younger students about financial literacy, work readiness and more. In 2015, the district took the initiative a step further and partnered with Rowan University. Rowan students in 2016 joined the high school students and parents in the volunteer efforts. At a time when financial literacy and career readiness education is crucial, the Washington Township Community Initiative continues to grow, and is being used as a model by other area school districts.